This short communication presents an ecosystem assessment framework developed within ESMERALDA; a Horizon2020-funded EU project aimed at delivering a ‘flexible methodology’ to assist towards pan-European and regional Mapping and Assessment of Ecosystem Services (MAES). The framework we present is closely aligned with assessment frameworks developed within the MAES (2014) and Millennium Ecosystem Assessment (2010) initiatives. Mapping, fundamental to the work of MAES as well as ESMERALDA, is placed at the heart of a wider suite of activities carried out within ecosystem assessment. This enables flexibility in where and how integration takes place. Beyond the biophysical parameters at the core of the framework, emphasis is given to the inclusion of social and economic factors to ensure policy relevance. Consultation, both internal to the ESMERALDA Consortium and external - amongst those already conducting ecosystem assessments across Europe - helped guide the development of the framework. Online consultation will provide information about the development of guidance around the framework and initiate the collation of good practice examples. The framework and accompanying guidance will contribute towards a final guidance tool due at the end of the ESMERALDA project lifetime. ESMERALDA aims to support EU member states to achieve Action 5 of the EU Biodiversity Strategy to 2020; 'Improve knowledge of ecosystems and their services in the EU'. By providing a flexible methodology underpinning the development of pan-European and regional assessments, the project assists member states to implement Action 5 with the ultimate aim of maintaining and restoring ecosystems ( EC 2011 ). This short communication presents a refined framework for an integrated assessment ( Brown et al. 2018 ) developed as part of a broader package of guidance and tools being delivered by the ESMERALDA project. The framework furthers the MAES process by clearly setting out the role spatial analysis can play within ecosystem assessments in relation to non-spatial approaches. Importantly, the framework has three key elements: 1. it identifies assessment activities that are not part of traditional biophysical ecosystem assessments (i.e. inclusion of social and economic factors); 2. it provides an improved structure for how these activities best fit sequentially with respect to biophysical assessments (i.e. mapping, fundamental to the work of MAES as well as ESMERALDA, is placed at the heart of this wider suite of activities); and 3. it provides a flexible approach in terms of its application so that users can select, and integrate, only those activities most appropriate to their needs. The word 'integration' in this case is defined as bringing together otherwise distinct parts and combining them into a whole. In the context of the framework presented here, it is important to note that integration can happen at different levels within an assessmentand practitioners can use the framework to assist identification of where and when this integration might occur. Bringing together all these distinct parts during analysis stages, allows for investigation into the interactions between different biophysical, socio-cultural and economic elements and should assist practitioners in developing policy-relevant key findings. Ecosystem assessments can bring together different stakeholders around an issue or policy question, comparing different land use and management options, framing ideas in new ways and developing stronger links between science and policy. Embedding assessment activities within the decision-making process, alongside the engagement of stakeholders, will maintain policy relevance of the outcomes. Traditionally, frameworks which focus on the assessment process are simplified in nature. For example the Millennium Ecosystem Assessment process, as set out in Ash (2010) , is presented by two boxes covering the core activities associated with the actual assessment: ‘implementing work programme’ and ‘peer review’. Activities not commonly identified as 'core activities' are those that can individually be undertaken to build up the assessment of ecosystems. Burkhard et al. (2018) begins unpacking the ‘implementing the work programme’ stage by focusing on the biophysical spatial analysis element of an ecosystem assessment or the backbone of the technical aspect of the assessment. In particular, Burkhard et al. focuses on mapping and assessment of ecosystem condition and ecosystem services. 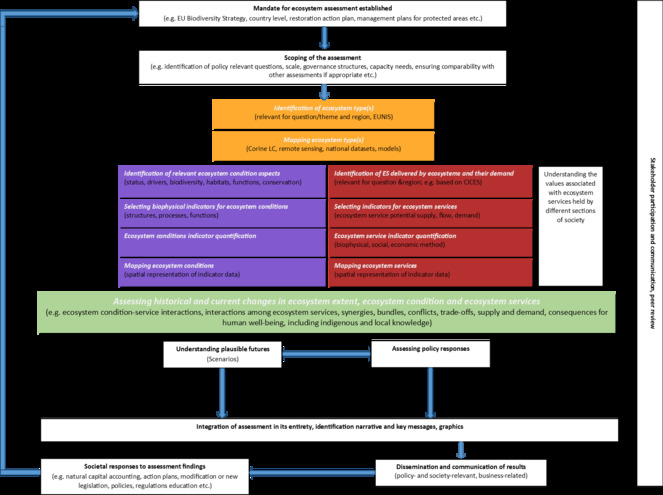 The ESMERALDA integrated ecosystem assessment (IEA) framework ( Fig. 1 ) builds on this approach by placing elements related to mapping and assessing ecosystem condition and ecosystem services within a broader set of activities that an assessment practitioner might want to undertake depending on the mandate and scope of the ecosystem assessment being undertaken. These activities include understanding the diverse values and benefits provided by different ecosystem services, scenario exercises, assessing different response options and communication: these activities capture the broader work being undertaken within the ESMERALDA project. An integrated ecosystem assessment framework as developed within the ESMERALDA project. Drafted by Brown et al. (2018) based on Burkhard et al. (2018) and the 2nd MAES report ( EC 2014 ). The core of the framework is built up from elements from the Burkhard et al. (2018) framework: identification and mapping of ecosystem type (orange), ecosystem condition (purple) and ecosystem services (red). These are placed within a broader set of assessment activities (white) such as 'understanding plausible futures' and 'assessing policy responses' that can enhance understanding of the diverse values and benefits provided by ecosystem services. Integration can happen at different levels within an assessment and practitioners can use the framework to assist identification of where and when this integration might occur. The framework can provide guidance to practitioners as to the distinct elements and/or activities they will integrate, depending on their needs. The green box suggests different types of interactions between elements of the ecosystem assessment that practitioners might want to consider. This will enable the characterisation of trade-offs, synergies and consequences for human well-being. The ESMERALDA IEA framework begins with the mandate, or intended goal, for the ecosystem assessment. Having a mandate for the assessment will support the implementation of the assessment findings. Once a mandate is established, the scope of the assessment can be explored through a multi-stakeholder process, allowing for differing views to be tabled. The scoping process should lead to the identification of a set of policy-relevant questions and other issues, such as the desired governance structure. It is during the scoping phase that the questions of ‘How?’ and ‘Where?’ integration will take place should be considered. Once the scope of the assessment has been agreed, then the assessment can begin. Core to the assessment is the identification and mapping of ecosystems and their condition, in conjunction with ecosystem services and their associated values. Assessment practitioners will probably undertake these as separate activities, integrating all information in a subsequent stage. It is important to note that integration happens at different levels within an assessment. Integration will aid understanding of issues such as trade-offs, synergies and consequences for human well-being. Integration of other non-spatial data can complement the spatial data used thus far. Assessment practitioners may also wish to supplement this with information on scenarios and policy responses. Further integration is undertaken to bring the entire assessment together. At this stage key messages or an overall narrative can be identified. For example, in almost all activities practitioners will need to integrate different types of data, as well as pulling together spatial and non-spatial data at key points. Furthermore, the process needs to be able to respond to different stakeholder interests. Ecosystem assessments are inherently integrated; however the level, stage and definition of integration is by no means uniform or clear, making it difficult to compare results from assessments across Europe. Integration may focus on biophysical elements (e.g. MAES assessment framework), whilst others have extended this to include socio-economic parameters and links to human well-being (e.g. Millennium Ecosystem Assessment) and/or indigenous and local knowledge (e.g. IPBES Assessments). Some assessment practitioners use the word ‘integration’ to simply refer to the inclusion of stakeholders within the assessment process. During the development of the ESMERALDA IEA framework presented here, extensive stakeholder consultation was undertaken to broadly capture the breadth of how 'integration' has been interpreted within ecosystem assessment. This framework has been developed to provide assessment practitioners with a tool that enables them to bring together different activities of existing ecosystem assessment frameworks and processes. The framework enables practitioners to use a flexible approach when selecting the elements of the ecosystem assessment that they wish to integrate. It is an adaptation of the assessment framework developed in the Millennium Ecosystem Assessment (MA) published in 2005 ( Ash 2010 ) and is closely aligned with the conceptual framework developed in 2013 as part of the Mapping and Assessment of Ecosystems and their Services (MAES) initiative ( EC 2014 ). The framework was developed around the ESMERALDA mapping framework whilst drawing on examples of best practice in ecosystem assessment from Finland, Flanders (Belgium), France, Germany, the Netherlands, Portugal, Spain and the UK. The MAES framework, which provided a core assessment structure, has two key features; it highlights how ecosystem condition is affected by different pressures and focuses on the spatial elements of ecosystem assessment. These elements were refined in a framework developed by Burkhard in 2016 and published as Burkhard et al. (2018) . However, this core assessment structure focuses on the mapping aspects of an ecosystem assessment and, in particular, articulates the inclusion of the often overlooked issue of ecosystem condition. Depending on the scope of the ecosystem assessment, there are other activities (e.g. understanding plausible futures, assessing policy responses) which can be undertaken to assist in answering specific policy-relevant questions (see Maes et al. 2018 ) and contribute towards even greater integration of different aspects of the assessment. To support assessment practitioners in understanding this broader landscape of assessment activities, the ESMERALDA IEA framework was developed, as an expanded version of Burkhard et al. thinking. The final ESMERALDA framework was developed through an iterative process of consultation and has been accepted by members of ESMERALDA Consortium. It seeks to show more comprehensively the entire assessment cycle, helping place ESMERALDA and MAES activities into context. It also indicates where key decisions on integration should be made. In practice, the final design of any IEA will be dictated by the policy questions asked, outcomes desired and resources available. In developing the final framework, consultation around both the framework structure and accompanying guidance was initiated. The overarching aim of the consultation process was to develop a common understanding of what integration means to assessment practitioners. The first consultation stage was internal to the ESMERALDA project and gathered comment on previous versions of the framework that is presented in this paper. This process commenced in March 2017 and was finalised in January 2018. ESMERALDA workshops in Madrid, Plovdiv and Trento provided a space for further discussion and comment. Specific questions asked of respondents included: ‘What kind of integration needs to occur and where does it take place in the assessment process?’ and ‘How different does an integrated ecosystem assessment look compared to a non-integrated one?’. Feedback from this iterative consultation process led to several important alterations to the ESMERALDA IEA framework structure. These included a more comprehensive scoping stage, improved clarity over where spatial and non-spatial elements could be incorporated, more appropriate and clearer positioning for where the actual assessment takes place and improved wording to ensure relevance to decision-makers and to convey flexibility in integration of different elements (e.g. integrating biophysical, social and economic components). Many comments related to the use of the term ‘ecosystem condition’ within the framework and the level to which it had been defined. Ecosystem condition is a complex concept and is represented to a degree that is sufficient for the purpose of this framework within the broader objectives of ESMERALDA. Further investigation into the use of indicators to assess ecosystem condition and the relationship between ecosystem condition and the delivery of ecosystem services are investigated in more depth in the 5th MAES report ( EC 2018 ). We also received several comments about aspects that we did not incorporate into the framework graphic. We decided the comments were largely deemed too complex for this sort of visual representation. Elements such as ecosystem types, pilot studies, policy responses, scenarios and the use of spatial and non-spatial data, will be explored in further depth within guidance documents published through ESMERALDA this year. The second consultation stage was external to the ESMERALDA project and, rather than eliciting further comment on the framework, focused on the development of a flexible methodology and guidance around integration. Feedback was gathered through an online survey sent to relevant stakeholders (MAES working group and country contacts, the Sub-Global Assessment Network and the ESMERALDA stakeholder group) from December 2017 to March 2018. A central aspect of the ESMERALDA project is to promote active dialogue across the EU to share experience, enable knowledge co-creation and develop a better idea of the specific needs of member states ( ESMERALDA 2014 ). The aim of the survey was to develop a better understanding of how practitioners and policy-makers have carried out integrated ecosystem assessments in the past; what tools they have used and how they have defined ‘integration’. Identification of challenges and strengths in implementing integrated ecosystem assessments will assist in the development of a flexible methodology and guidance to accompany the ESMERALDA IEA framework. Results from this online consultation are presented within ESMERALDA deliverable 4.8 ( Potschin-Young et al. 2018 ). This deliverable also presents the results of seven case studies specifically testing the ESMERALDA IEA framework. It is essential when designing an ecosystem assessment to consider how and where the concepts of integration will be considered to address policy-relevant questions. While assessment processes are not well documented or evaluated, anecdotal evidence suggests that integration through the governance structure (inclusion of stakeholders), combining of different data sources and the use of appropriate tools allows for greater impact of the ecosystem assessment within decision-making. The IEA framework, presented here, builds on work that already exists, namely the MA, IPBES and MAES, introducing new ways of understanding what constitutes an IEA whilst taking into consideration the wider ESMERALDA project given its specific objectives. Extensive stakeholder consultation has helped shape the ESMERALDA integrated ecosystem assessment framework that has now been accepted by the ESMERALDA Consortium. Practitioners can use the framework to identify where they need to integrate different elements. By employing such a framework, assessment practitioners are supported to think through which activities are required to address the policy-relevant questions and to identify where integration will take place, ultimately leading to an assessment that meets the needs of policy-makers. The framework provides an evolution of thinking underpinning an integrated ecosystem assessment by clearly setting out the different elements of an assessment process. The framework is not viewed as the totality of thinking in ESMERALDA on the notion of an integrated ecosystem assessment. This thinking will need to be developed further to ensure ESMERALDA outputs have relevance to EU Member States and political traction beyond 2020. We acknowledge all those people involved at different stages during the development of this framework, offering their time and knowledge to this work. Specifically we acknowledge Marion Potschin-Young and Roy Haines-Young for their invaluable contributions towards both the development of the ESMERALDA integrated ecosystem assessment framework and this manuscript. We also acknowledge the ESMERALDA Task 4.4 Partners for their input during early framework development; Ildikó Arany and Bálint Czúcz (MTA ÖK), Mariana Nikolova (Bulgarian Academy of Sciences), Cristian Mihai Adamescu (BU) and Cristina Marta-Pedroso (IST), as well as other ESMERALDA partners who have contributed towards the consultation stages; Sabine Bicking, Felix Müller and Marion Kruse (CAU), Leena Kopperoinen and Arto Viinikka (SYKE), Luke Brander (VU), Inge Liekens (Vito), Stoyan Nedkov and Boian Koulov (Bulgarian Academy of Sciences), Adrienne Grêt-Regamey (ETH Zürich), Mario V Balzan (MCAST), Ola Inghe and Hannah Östergård (SEPA), Joachim Maes (JRC), Panayotis Dimopoulos (University of Patras) and Graciela Rusch (NINA). We are also appreciative of the guidance and input received from the ESMERALDA Executive Board. Mapping and Assessment of Ecosystems and their Services: Indicators for ecosystem assessments under Action 5 of the EU Biodiversity Strategy to 2020. 2nd Report- Final February 2014. Enhancing ecoSysteM sERvices mApping for poLicy and Decision mAking: H2020 Coordination and Support Actions. Topic: Enhancing mapping ecosystems and their services. Call: SC5-10a-2014.